In small bowl, mix all sauce ingredients. Refrigerate until serving time. In deep fryer or heavy 3-quart saucepan, heat 2 inches oil to 360°F. In medium bowl, stir cornmeal mix, buttermilk, egg, salt and pepper. Stir in cheese and bacon. Drop batter by tablespoonfuls into hot oil. Fry 2 to 3 minutes, turning several times, until golden brown. Drain on cooling rack over paper towels. 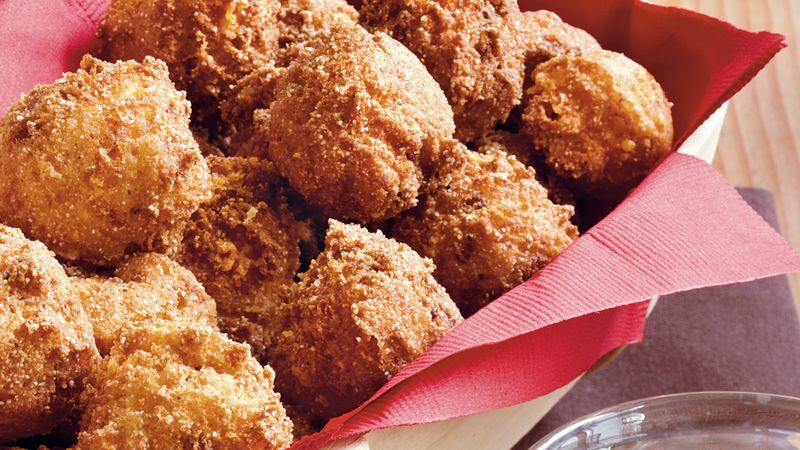 Serve hush puppies hot with Spicy Ranch Sauce. Once the hush puppies are cooked, place them in a 15x10x1-inch pan and keep warm in a 250°F oven until ready to serve.